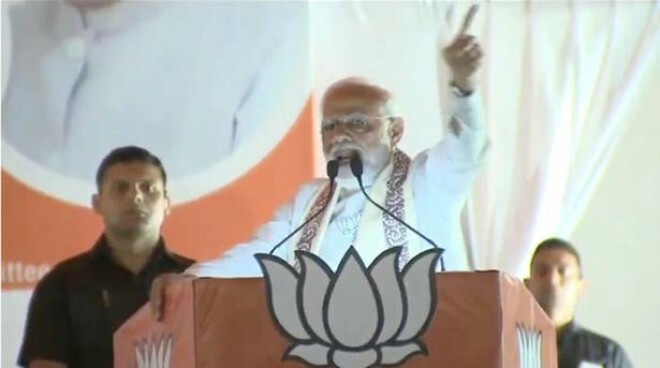 Imphal, Apr 07: Prime Minister Narendra Modi on Sunday alleged that the Congress, through its manifesto, is blowing the trumpet of Pakistan more than that of India. Addressing a rally here, Modi also noted that Congress had claimed no one could tamper with Article 370 of the Constitution, an assertion which Pakistan agreed to. "Congress is helping spread propaganda of Pakistan across the world... Congress' hypocrisy document seems to blow the trumpet of Pakistan more than that of India," he said. "The Congress stands with those who want separate prime ministers for India and Jammu and Kashmir," Modi said. Polling for the two Lok Sabha seats in Manipur will be held on April 11 and April 18.